These days, if you want to photograph a Great White Shark, all you have to do is join a tour to Guadalupe Island where the sharks are practically guaranteed, the water is crystal clear, and the weather will most likely be fabulous. 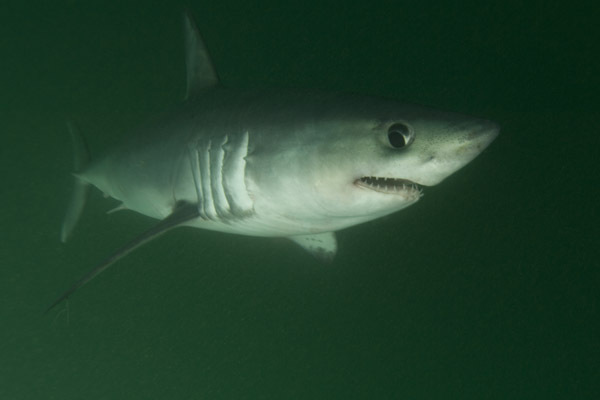 If however you want to photograph a Porbeagle Shark, be prepared for a logistical nightmare. 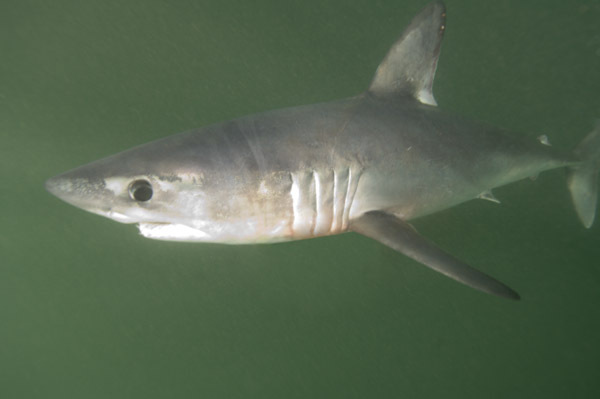 For many years I have dreamed of seeing a Porbeagle. Somewhere between a Great White and a Mako, it is famous among fishermen for its pitbull-like endurance and fighting spirit. 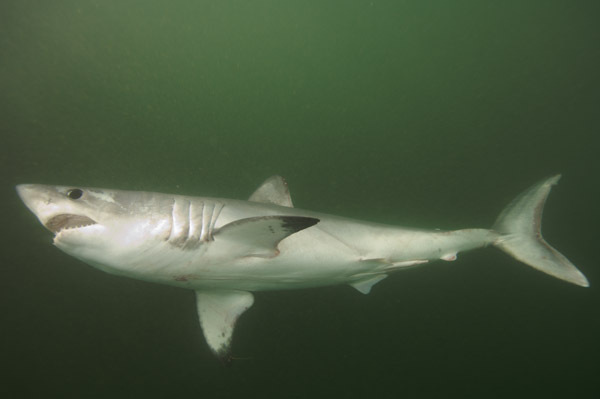 Although aggressive when captured, the Porbeagle is normally so shy that the sound of a diver's bubbles is enough to make it turn tail and flee. Consequently, it is very rarely encountered underwater. Porbeagles are found on both sides of the north Atlantic. On the Canadian side of the pond they are most abundant in the stormy waters of the Bay of Fundy which is notorious for its immense tidal exchanges often exceeding 20ft. The monster tides drag vast quantities of silt out into the bay, so the visibility is usually horrendous. 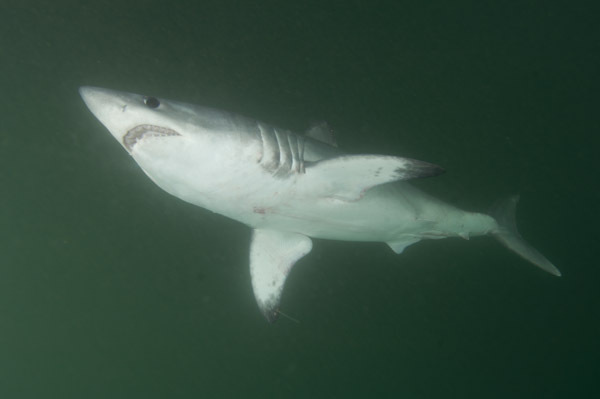 Add to this, the ripping currents, a lack of diving infrastructure, and the shark's naturally timid demeanour, and you can see why there are so few shots of Porbeagle Sharks. 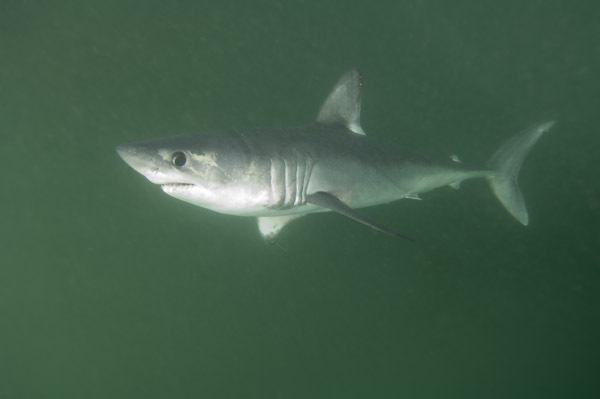 Fortunately, Steve Turnbull from the University of New Brunswick is currently conducting a tagging study of the Canadian Porbeagle population. With fellow adventurer Eli Martinez, I joined his team aboard the converted 54ft lobster fishing boat Storm Cloud with the irrational idea of jumping off the back of the ship with my camera at the ready, as soon as a large Porbeagle was seen swimming up the chum slick. Somewhat surprisingly, the captain agreed to this plan. Once we were underway, I prodded Dr Turnbull for any information that he could give me about Porbeagles. He rattled off the stats: max length about 11ft, max weight at least 600lb, numbers slowly declining, etc. He explained that he is hoping to find out whether the Bay of Fundy population is resident or transient. If local fishermen recatch his tagged animals in the future then the population is probably static and therefore more vulnerable to over fishing. It was well into the afternoon when a Porbeagle finally snagged one of our hang baits. While Steve=s team readied their tagging equipment, Eli and I scrambled into our dive gear and slipped off the back of the ship. Eli was on snorkel and I opted for a pony bottle and added enough lead to sink under the shark. As soon as we hit the water we realized our mistake. Although the fishing boat was drifting with the current, we were immediately swept away from the ship and I shouted for a tow line while we frantically scissor kicked to stay in position. Seizing the offered line, I dragged my way back to the hull and peered downward into the soupy water. Below me the Porbeagle Shark was tiring and I fired off a few shots to record its struggle and to dial in my camera=s exposure. The waves broke relentlessly over us and I was glad that I had an independent air supply. Even so, it took a tremendous effort to hold my camera up to my face with one hand in the 3 knot current and buffeting chop. Behind me, Eli was struggling with his bulky video housing. I could hear the air whistling through his snorkel and before long he grabbed one of my fins and climbed over me towards the ladder. Meanwhile, Steve's team had gotten everything ready. They lowered a sling into the water and guided the hooked Porbeagle onto it. The shark instantly relaxed and remained completely motionless while it was hoisted onto the deck for measuring and tagging. I held onto the ladder waiting for the big moment while trying not to get sucked under the hull as it rose and fell ominously next to my head. The shark, now free of its hook, appeared once more over the gunwale. In one fluid motion it slipped back into the ocean and swam warily past me then turned and headed off into the darkness. 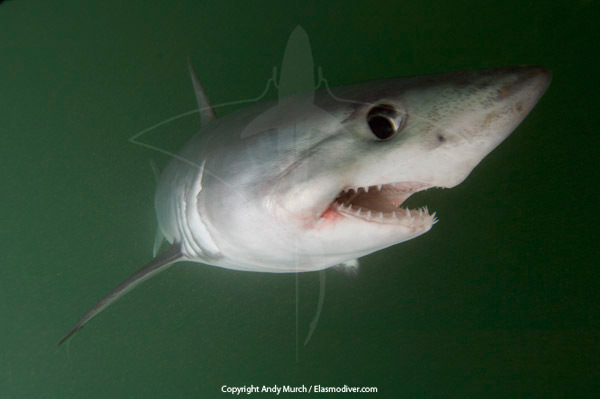 I composed as many images as I could but within a few short seconds the departing Porbeagle was little more than a dark smudge on an olive green canvas. Slowly my thoughts returned to the tearing current, the cold, and the slapping sound of the hull beside my ear. At this point I had no idea if I had the shot but I was overjoyed regardless. 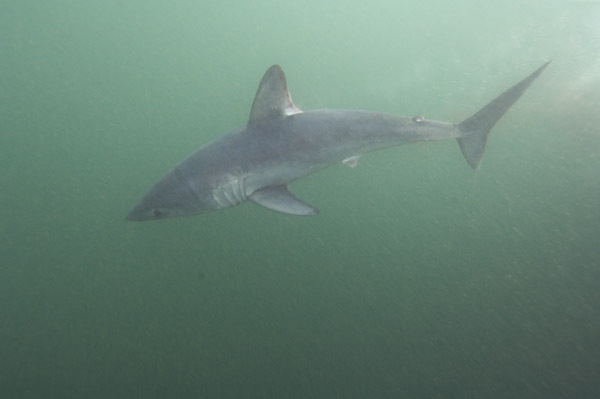 Only a handful of divers have swum with a Porbeagle Shark and the image of its searching eye briefly locked on mine as it swam past me, was indelibly etched on my memory.